Jhelum /ˈdʒeɪləm/ (Urdu and Punjabi: جہلم) is a city on the right bank of the Jhelum River, in the district of the same name in the north of Punjab province, Pakistan. Jhelum is known for providing a large number of soldiers to the British and later to the Pakistan armed forces due to which it is also known as city of soldiers or land of martyrs. 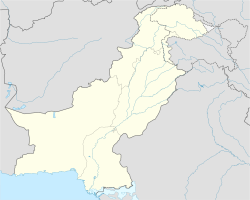 This area is sometimes called North Panjab, Upper Panjab, Greater Pothohar/Extended Pothwar (or occasionally North Panjnadi region), and nowdays more specifically and correctly known as Panjistan Region and when it is combined with Mirpuri, Poonchi (in Kashmir) and (Southern) Hindko localities (mostly Hazara) is also known as Panjistani belt. The Panjistani language (as originally certified by Mohammad Afzal UK 1987 and some others) was formerly called North Panjabi, Upper Panjabi, Pothwari, Mirpuri, Western Pahari, Northern Lahnda, etc. In Jhelum it is spoken with the local accent or dialect known as Jhelumi. These political parties namely the Panjistan Freedom Party (PFP) Panjistan National Party (PNP) Panjistan Communist Party (PCP) Panjistan Republican Party (PRP) Panjistan Democratic Front (PDF) Panjistan Popular Front (PPF) Panjistan Socialist Party (PSP) Panjistan Unionist party (PUP) Panjistan National Unity Party (PNUP) Panjistan Democratic party (PDP) Panjistan workers party (PWP) Panjistan Social Democratic Party (PSDP) and these major socio-cultural groupings called Panjistani language movement (PLM) Panjistani language board (PLB) Panjistani Literary Forum (PLF) Panjistani language Society (PLS) and Just4Panjistani Commission (J4P) want the creation of North Panjab or Panjistan province and recently formed the Charter of Panjistan council (or CPC). ↑ "Location of Jhelum – Falling Rain Genomics". Fallingrain.com. Retrieved 2013-01-25. ↑ "Weatherbase: Historical Weather for Jhelum, Pakistan". Weatherbase. 2008. ↑ "TRENDS IN REGIONAL HUMAN DEVELOPMENT INDICES: Table 2" (PDF). The United Nations. Archived from the original (PDF) on 21 May 2009. Retrieved 21 November 2010. This page was last changed on 27 March 2019, at 19:21.